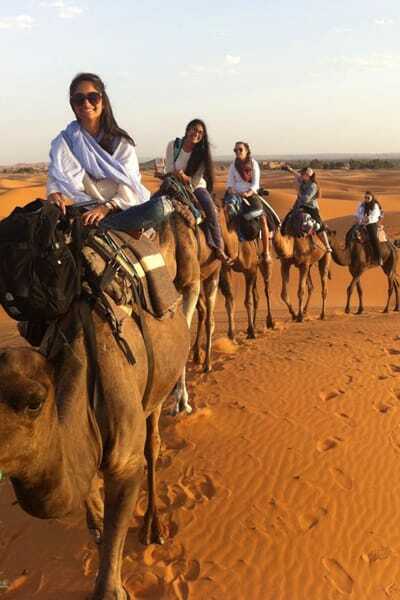 ﻿Based in Imlil year-round, Aztat Treks is an independent Berber operator owned by Mohamed Aztat, organising private Atlas trekking, camel-trekking & 4×4 adventure holidays in Morocco's epic outdoors, alongside tailor-made tours. up with a cultural itinerary or trekking excursion of a lifetime!.. Our treks & Tours are available to book and start at any date and for any duration, singles are & groups are welcomed. 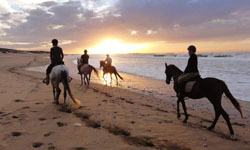 We also put together custom tours to meet your further requirements, including family friendly holidays. 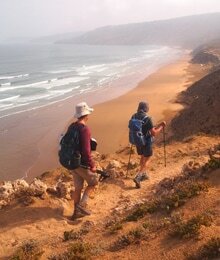 The links below provide details of our top-list treks and adventures we can arrange for you during your stay in Morocco. 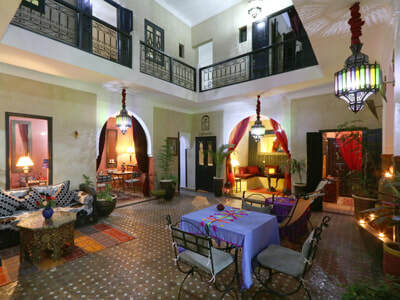 We stayed at the cosy Dar Adrar (family room from £35 B&B: the charming proprietor Mohamed can arrange walking guides). From The BBC-Radio "We headed for the hills to speak to a man who spends his days with his head in the clouds. We went live to the Atlas mountains in Morocco, to join one of their top guides Mohamed Aztat. " "Dar Adrar is run by one of the star guides of the Atlas, Mohamed Aztat"
"In Morocco"s mountains There's solitude high up in the Atlas Mountains only your guide, your mule and a few excited locals will know you are there...Welcome to the happy valley, said our guide, Mohamed Aztat, when we stepped out into this Arcadian landscape next morning. " 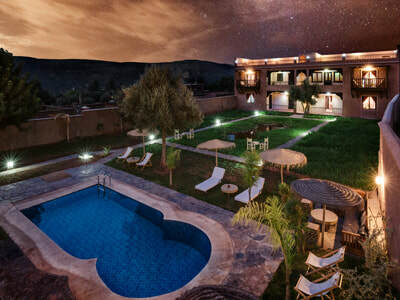 From the Roughguide " Owned and operated by trekking guru Mohamed Aztat, Dar Adrar is a hidden gem. En-suite rooms, great food, nice sitting rooms, and even family rooms are offered in this cosy mountain guesthouse. Free wi-fi. Meals are prepared on site for . " From the Guardian " ...A visit to the studio is featured on a four-day Atlas Trek Shop tour of the Erg Chebbi sand dunes and Ait Benhaddou Desert which starts and ends in Marrakech. 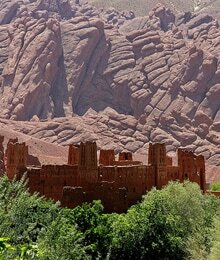 It includes a two-hour scenic drive along Tizi n'Tichka.. "
From InsightGuide Marrakech " For proper treks, contact the Atlas superguide Mohamed Aztat (0668 76 01 65, aztat.rando.free.fr ), who can arrange day trips and longer hikes into the mountains, with your transfers from town laid on "
From the CondenastTraveller "PLUS, Hire a Berber guide and head out of Marrakech for a trek in the Atlas Mountains... Mohamed is simply the best guide with whom I have walked in Morocco..."
Adventure Travel: Atlas Mountains Treks , Sahara trips and Day Excurions. Morocco offers good opportunities for trekking, including the Atlas mountains Jebel Toubkal , Jabel M'goun, Jebel siroua and the Jbel Saghro. 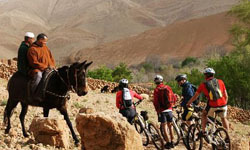 Depending on your fitness level, and season, you can trek, walk or ramble in different regions of Morocco, with or without mules to carry the kit, with a guide. 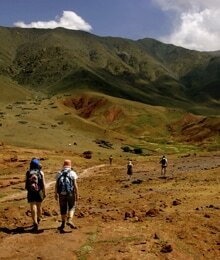 Trekking in the Atlas Mountains makes for an incredible holiday. The tiny villages perched on the sides of the mountains, the warmth and hospitality of the Berber people and the spectacular views all add up to an amazing Atlas Mountains holiday. North Africa’s highest peak, Jebel Toubkal vaults 4167m into the heavens in the Central High Atlas, dishing up views that more than reward the effort of trawling up there. This quasi-mythical mountain is the most eulogised peak in the country and it well-deserves the praise heaped upon it. 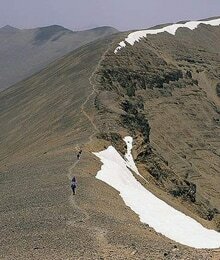 In summer it is an adventure that most reasonably fit people can tackle in two or three days from Imlil. In winter, when the trails are thick with snow, Toubkal is an even more serious beast requiring specialist gear and skills. For an exhausting but exhilarating challenges, there are also longer gruelling Toubkal treks that takes around a week to complete. Our stunning trekking itinerary begins in the picturesque Bou Guemmez Valley and leads south-westwards through the impressive Atlas range, which includes North Africa's highest peak. En route, we visit the fortified villages of the friendly Berbers and climb on good trails through remote and often uninhabited valleys to reach high and scenic camping places. 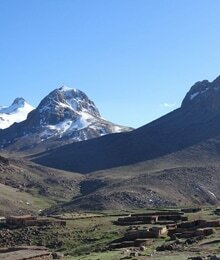 Morocco's remote Jbel Saghro Massif is a real treat for the trekkers who's done it all. This volcanic mountain region does not experience true winter snows like the High Atlas making it great aarea for winter hiking. The Saghro is situated between the High Atlas mountains and the Sahara desert and makes a nice link to also experience an overnight camel trek and explore the Erg Chebbi dunes. 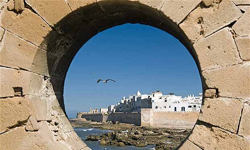 Travel overland to the fascinating and magical country of Morocco, where you can immerse yourself in the local culture, sample the delights of the bazaars in Marrakesh, experience some spectacular climbing in the Atlas mountains. 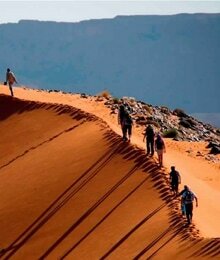 Morocco is a very worthwhile destination for Duke of Edinburgh expeditions. 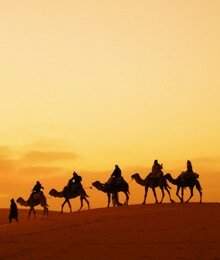 The desert is known in Arabic with the word Sahara. 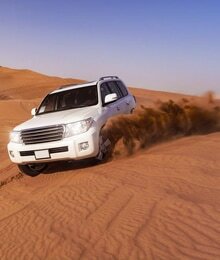 It’s an area of land which is waterless, desolate with little or no vegetation; typically covered with sand. 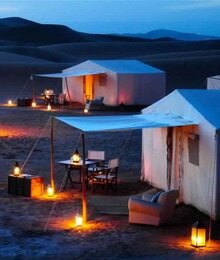 The Moroccan Sahara belongs to the African desert which is the biggest desert in the world. The village of Merzouga is situated in the south-east of Morocco, it is the entrance to the Sahara and it is where the adventures start in the astonishing sand dunes of Erg Chebbi. 6 Day Erg Chigaga Walking trek. 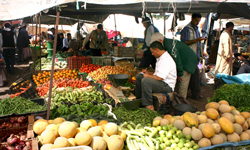 If you’ve explored the Marrakech medina and haggled for bargains in the sprawling souk, heard storytellers weave their magic in the Djemaa el Fna square, and dined al fresco on Moroccan cuisine, it’s time to travel further afield to discover more of the magic of Morocco. This was a five day trek including 3 nights in Berber villages. The last day, we climbed the Toubkal summit. From mountain cabine to the summit in the snow! Great experience. We (my daughter and I) had our personal guide( Mohamed Avaab) and muleteer (Abdellah Inttifi). The latter was an excellent cook. We enjoyed his delicious prepared food. Our guide was excellent. He walked with an adapted pace... so that we were not exhausted at the end of the day. We found AZTAT treks through google search and organised a four day/three night trek via email. We advised Mohamed of what we were after - scenery, villages, valleys, local people, etc and were assured that anything was possible. This is one of the great things about Aztat, they can tailor the trek to ensure you get what you want and also to ensure the walking is within your abilities. Our trek was a fantastic experience walking through the Zat and Ourika valleys with Ibrahim, Mohamed and Samir as tour guide, muleteer and chef. 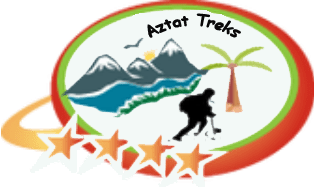 We were really well looked after by the team and would recommend AZTAT treks to anyone thinking of walking in the Atlas mountains. The scenery was amazing, the team were great company, and the food was good. All you need is a good pair of walking boots, a sleeping bag, reasonable fitness, and you are right to go. There were four us: my wife and me and our two teenage daughters and we had a wonderful day's trekking through the Atlas mountains starting from Imlil. Our guide, Hussain obviously knew the mountains like the back of his hand probably because he was born in and still lives in one of the Berber villages that we visited. The trek was all very well organised by Axtat Trecks and we enjoyed every moment. 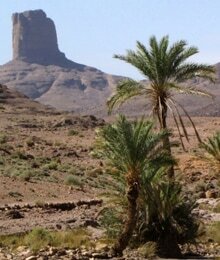 The scenery is beautiful and dramatic and we had a delicious lunch prepared especially for us in a Berber family home. Marvellous! We had an excellent 3 day Express tour of the Atlas Mountains and Sahara desert with our tour guide Hisham. He was a perfect guide and looked after us very well! He was very knowledgeable, with excellent English and was good fun too! The driver Hasam was also very good and made us feel very safe. The tour was very easy to book and Mohammed answered all of our questions quickly in the lead up. We want to thank you so much for accommodating us with our three different treks. We wanted to take this opportunity to acknowledge your professional staff of guide, cook, and animal wranglers. 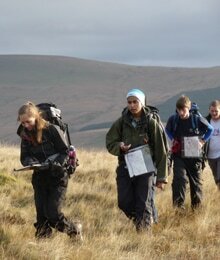 We felt we were given exemplary service, that exceeded our expectations everyday of our treks. Hamid and Samir made us feel as if we were friends! They are are quite a pair! They work well together and they go above and beyond their call of duty every second of the day! The mule drivers and camel drivers were a big part of our adventure as well! Together these wonderful people made us have one of the wildest adventures of our life! Because of them we made memories that will last a lifetime! Our two day hike up Toubkal was amazing - the scenery is beautiful and peaceful. Our guide, Ibraham, was knowledgeable, friendly and made sure we were comfortable and happy the entire trip. The food was wonderful (thanks Hamad) - and dealing with this company was extremely easy and hassle-free. 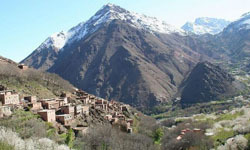 I would highly recommend a trip outside of Marrakech to the Atlas Mountains - and with Aztat Treks! Perfect organisation of this 6 days tours. Good time with our guide. 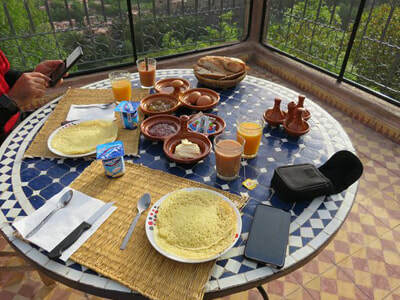 We highly recommend the service of a guide to trek in the Atlas Mountain, and also for the desert tour for the cultural and historic explanations. Aztat Treks was a excellent choice, Choosing a local company is also better for the local economy. 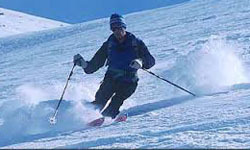 Hi I am looking to do a winter climb of toubkal this year and was wondering what is the best time of year for snow. 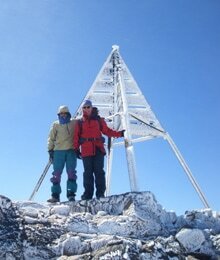 I did a three day ascent last October with your company and its was great . Could please let me know what the costings would be for a winter ascent and how many days the trek would be.